I intended on posting this last night in order to keep up with my aim of writing a post everyday for a week but unfortunately ran out of time. I always love soups, especially for lunch, but as the weather starts to turn autumnal soups come into their own. Warming and filling they are decidedly satisfying. I made three batches of soup which I have optioned up and put in the freezer to take out for lunches either at work or home. As most of my previous posts I'm afraid I haven't got a 'proper' recipe'. I have a tendency when cooking to cook by tasting as I go and experimenting with flavours I know complement each other, borrowing from memories of recipes I may have followed at some point in the past. 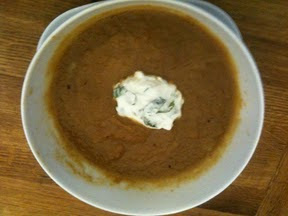 The first soup I made was a Spiced Pumpkin Soup with Mint Yoghurt. I started by peeling and roasting a pumpkin with 2 onions and 3 cloves of garlic (I know this sounds a lot but once roasted it takes on a lovely sweet and mellow flavour). I then added this to a large pan with some homemade chicken stock I had in the freezer, some ground chilli, cumin, corrinader, turmeric and garam masala (which I had dry fried for a few seconds first) and seasoned it well. I left it simmering for about 30 mins and the. cooled slightly before blending it until smooth. Taste to check the seasoning and add more if needed. It's great served with a generous blob of mint yoghurt (I use Greek yoghurt mixed with chopped mint and seasoning). Twice daily the cook came down from the village to teach us to cook and this soup is one of the recipes I've made many times since. The original had a small potato in it added at the beginning and some risotto rice added about 15 mins before the end so feel free to revert to the original. 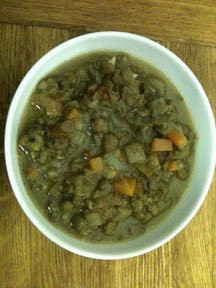 The result is a very thick, filling soup so could even be eaten as a light dinner. You start by frying a diced carrot, onion, celery tops and a clove of garlic in a pan. Once slightly browned and softened add a cup of dried green lentils, about 5 diced cherry tomatoes, seasoning and about a litre of stock. Simmer for about 45 mins, checking if more liquid is needed every so often. It should be thick by the end but you don't want it to dry out or burn on the bottom of the pan. About 5 mins before the end add another 5 diced cherry tomatoes and a handful of chopped parsley. Check the seasoning and serve. The final soup I made was a Chicken, Vegetable and Barley soup. 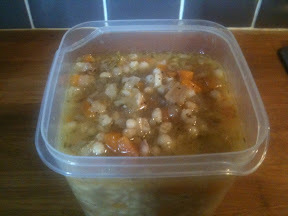 I love barley anyway and think it's a wonderful grain but in something like this simple soup it comes into it's own. I started by sautéing finely diced carrot, onion and celery as a base (the same idea as an Italian sofritto) I then added a crushed garlic clove, a cup of barley, seasoning a handful of shredded roast chicken (don't worry you really don't need a lot) and about a litre of brown chicken stock (this is made by taking the carcass from a roast chicken and putting it back in the own until the bones and any remaining chicken are quite brown. The carcass is then boiled in plenty of water for an hour or so to make a very tasty stock. You can also add veg to the stock pot but on this occasion I didn't). Cook this for about 45 mins until the barley is soft. Check every so often that there is enough liquid and add more water if necessary. About 5 mins before the end add a handful of chopped parsley. Sorry for the less than pretty serving bowl but this was ready to go into the freezer when I thought to take a photo! Guest baker - Cupcake Heaven!